To determine if a debit card is available, please sign into your account (click on the “Online Access/Account Detail” tab and follow the instructions). Once you are logged in, look under the “Participant Services” section on the Main Menu. If a debit card is available, you will see a button titled “Debit Card Information.” Follow the instructions to complete the Debit Card Application if you wish to obtain a card. If you do not see such a button, then your employer has chosen not to provide debit card access. We have included some of the most frequently asked questions on the FSA debit card below. What is the ASIFlex Card? The ASIFlex Card (a limited use pre-paid debit card) provides an easy way to pay for out-of-pocket health care expenses for you, your spouse, and any tax dependents. The advantage of the card is that you do not have to pay with cash or a personal credit card. The card will allow you to pay the merchant or health care provider directly from your health care account, and you can choose at each point of service if you want to use the ASIFlex Card or submit a traditional claim to be reimbursed. Whichever way you choose to be reimbursed, the IRS requires that all claims be fully substantiated. How do I use the ASIFlex Card? 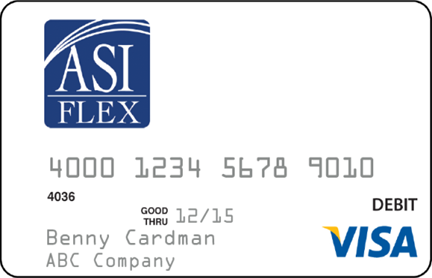 The ASIFlex Card can be used at health care providers that accept VISA® and certain retail merchants that inventory eligible health care products. It is not accepted at restaurants, gas stations, department stores, etc. At the point-of-sale, simply present your card for payment. You can sign for a credit transaction, or you can enter a PIN for a debit transaction. The merchant will process the transaction; the card company will then report basic information about the card transaction to ASIFlex. NOTE: The card company can only provide the merchant name or sometimes only a portion of the name, date of transaction and dollar amount. For this reason, IRS regulations require you to provide supporting documentation to show the actual date of service (regardless when paid), patient name, and a description of the service. It is important that you understand use of the card is not paperless and that supporting documentation is required in many cases in order to substantiate a transaction. What other types of documentation are acceptable? Explanation of Benefits (EOB) – If covered by insurance, you can submit a copy of your insurance plan EOB statement. Prescription Drugs – Prescription receipt, a print-out from your pharmacy, or a copy of the itemized mail-order statement. Over-the-Counter Health Care Products – Copy of the merchant itemized receipt that shows the store name, date, description of the product, and dollar amount. Over-the-Counter Drugs/Medicines – Copy of your attending physician prescription (written on the physician’s Rx pad), and the itemized merchant receipt that shows the store name, date, description of the product, and dollar amount. How am I notified if documentation is required? In order to have a card, you must sign up to receive electronic communication. If documentation is needed, ASIFlex will send notice to you via email and/or text alert. You can read your secure messages by signing into your account at asiflex.com. The message will explain what is needed in order to substantiate the transaction. If you do not respond to the first request, ASIFlex will send a second notice to remind you that documentation is needed and that your card may be temporarily deactivated as required by IRS regulations. If you do not respond, ASIFlex will send a third and final notice to let you know that your card is temporarily deactivated and that documentation is still required. All you need to do is provide the requested information, and the card can be activated. If you are unable to substantiate the transaction you can write a check back to the plan or submit a substitute claim. TIP: The IRS regulates health care plans and use of the card, so be sure to ask for and retain appropriate documentation each time you use the card in case you need to substantiate a transaction. How do I provide documentation to substantiate the transaction? First, only submit documentation if requested to do so. When you receive a request for documentation, be sure to include a copy of the request letter/message and submit online by signing into your account, via the ASIFlex Mobile App, fax, or mail. TIP: Be sure to register to view your online account, and get the Mobile App free through Google Play Store or the App Store. You can get the app for your mobile phone or tablet! Where does the FSA debit card work? Stores that have an Inventory Control System in place that confirms at the point of sale that any items that have been purchased are eligible for the Flexible Spending Program (FSA). What should I do if I’m unable to obtain the supporting documentation? You can repay the amount to the plan by writing a check or requesting ASIFlex to debit your bank account for the amount. You can submit a manual claim for another expense that has not yet be reimbursed. You can ask the provider to process a refund to return the funds to your account. TIP: It is important that you take necessary steps to substantiate transactions as requested. IRS regulations required unsubstantiated transaction amounts be reported as taxable income on your Form W-2. What types of expenses require documentation? Flat-dollar co-pay amounts that match the plan that you have elected through your employer (note that if you use the card for co-pays for any other plan, such as your spouse's plan, supporting documentation will be required). A recurring expense at the same provider for the same dollar amount each month that has been substantiated once with a traditional paper claim. For example, if you have a monthly chiropractor visit for $45.50 that does not match your co-pay, you will be prompted for documentation the first time. You need to substantiate the expense and include a note stating this will be a recurring expense. Future transactions at this same provider for the same amount will not require documentation. A transaction at a retail merchant (such as Walgreens, Walmart, Target, FSA Store, etc.) that inventories eligible health care products (such as Band-Aids, braces, sunscreen, contact lens solutions, etc.). All other transactions at medical offices, hospitals, physician offices, dental or vision care offices will prompt a request for documentation. This includes amounts for deductibles, coinsurance, etc. TIP: Be sure to ask for and keep a fully itemized statement each time you use the card. Providers do not automatically provide this information, so it is your responsibility to ask for it. Also, be sure to obtain and keep copies of your insurance plan Explanation of Benefit (EOB) statements as you can submit these to substantiate a transaction. What is not accepted to substantiate my transactions? Do I have to use the card for all of my expenses? Online – Sign into your account at asiflex.com and submit your claim online. Mobile App – Snap a picture of your claim documentation and submit via the mobile app. Fax – Download and complete the claim form, submit with your documentation via toll-free fax. Mail – Download and complete the claim form, and mail with your documentation via USPS mail. TIP: If you do not want to submit backup documentation to substantiate your card transactions, don’t use the card and submit a claim to be reimbursed. This will vary by employer, so be sure to check with your HR/Benefits office to be sure. In most cases, participants can order a card by completing the “FSA Debit Card Application.” Some employers have cards automatically provided to participants. Two cards are mailed to your home address and arrive in a plain white envelope. Read the cardholder agreement, call to register your card, and select a PIN if you wish. TIP: Be sure to read and retain the cardholder agreement. If for any reason you decide that you do not want the card, please send a written request to [email protected] to request that the card be cancelled. Is there a fee for the initial card set? This will vary by employer, so be sure to check with your HR/Benefits office. Can I order additional cards? How long does it take to receive a card? In general, once the card order is submitted, you should expect to receive it within 14 business days. TIP: During peak periods it may take longer to receive the card. Are cards issued in my name and my family member names? Cards are issued in your name as the plan participant. The family member can still use the card by entering a PIN for a debit transaction or by signing the participant name for a credit transaction. How do I know what merchants will accept the card? TIP: Health care providers must have their card terminals coded to properly identify the business as a health care provider. Note that some teaching hospitals, for example, may code their terminals differently as an educational facility. In this case, the card would be rejected. You can pay for the service/supply, request an itemized statement, and submit a traditional claim for reimbursement. What are some other reasons that the card may not work? Deactivated – If you fail to provide documentation as requested per IRS guidelines, the card will be deactivated until you comply. Just sign in to your account at asiflex.com. Your account will highlight any transaction for which backup documentation is needed. Insufficient Funds – If you try to use the card for an amount that is more than your remaining balance, it may be rejected. Know your balance! Funds Not Loaded – Your health care election amount may not yet be loaded with new plan year funds due to delays by the employer or administrator. Non-Health Care Products – You may be attempting to purchase an item that is not a qualifying health care item, such as candy bars, magazines, etc. Merchant Problem – The merchant may encounter problems with their terminal or may be using a non-health care merchant identification code. Invalid Merchant – The card is accepted at health care providers and certain retail merchants that accept VISA®. It cannot be used at gas stations, clothing stores, restaurants, etc. TIP: In the event your card does not work, just pay for the item and submit a claim online, via the mobile app, fax, or mail. If your card is deactivated pending receipt of documentation for a previous transaction, the amount of your claim will be reduced by the outstanding transaction amount. Immediately report the lost or stolen card to ASIFlex. ASIFlex can issue a new card set, if requested. Your employer's benefit plan and use of the card is regulated by the IRS. Save all itemized receipts and insurance payer EOBs (not credit card receipts) so that you can substantiate a transaction. When notified, read your messages in your secure message center at www.asiflex.com and respond! Submit documentation if requested – it's the law! This process is not paperless. If you don’t like to submit documentation after using the card, just submit a claim instead. Know your balance! If you have only $20 left in your account and swipe the card for $25, the transaction may decline. Neither the VISA® system nor the merchant/provider may know why. Fax correctly! Be sure the fax is legible, includes your name, ID/SSN number and employer name. Do not highlight information. Keep your fax confirmation page. Transaction amounts that are not substantiated with documentation may be reported as taxable income on your Form W-2 and your card may be permanently cancelled. Review the resources on asiflex.com/debitcards. Carry the “ASIFlex Wallet Card” with you. ASIFlex is a Third Party Administrator of employee benefit programs, and has over 400 clients around the nation. We are located in Columbia, Missouri. Sign up for Direct Deposit & Email/Text notification to save time, money and the environment. © Copyright 2019 by ASIFlex. All rights reserved. You are leaving the ASI Flex Website. Click Cancel to stay on the ASI Flex Website. Click Continue to go to the FSA Store.